I chopped several inches off my hair and got it lightened a bit. I was ready for a change and it feels so summer appropriate. The weather has been so perfect lately. Warm and breezy… I love it. I’ve been doing very little reading lately, but last week I changed that. I picked up this book, tackled it in a few days and loved it. I’m on to this one next. My sister Caitlin and her boyfriend Micheal came to stay with us on the weekend. Unfortunately I came down with a cold so we didn’t get to do as much as we wanted, but we still enjoyed the time spent together. 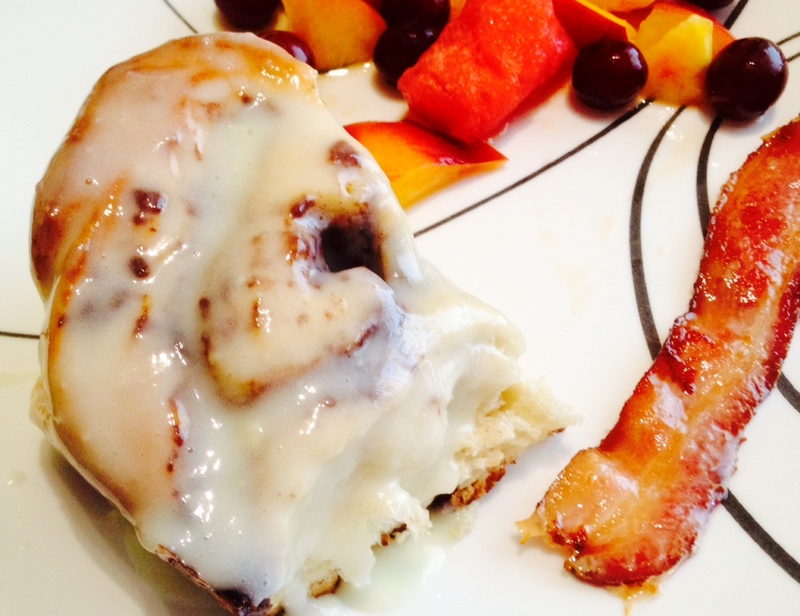 I made cinnamon rolls, bacon and fruit salad for brunch on Saturday morning. I am so into brunch lately. My sister and I saw Maleficent at the theatre while the boys watched football. It was a cool spin on the original Sleeping Beauty (my favorite) and Angelina Jolie killed it, in my opinion. I was grateful for Echinacea this weekend. It always gets me feeling better quickly when I’m under the weather. Good friends of ours invited us to the baptism of their son. The church was beautiful and it was really special to witness a milestone like that.